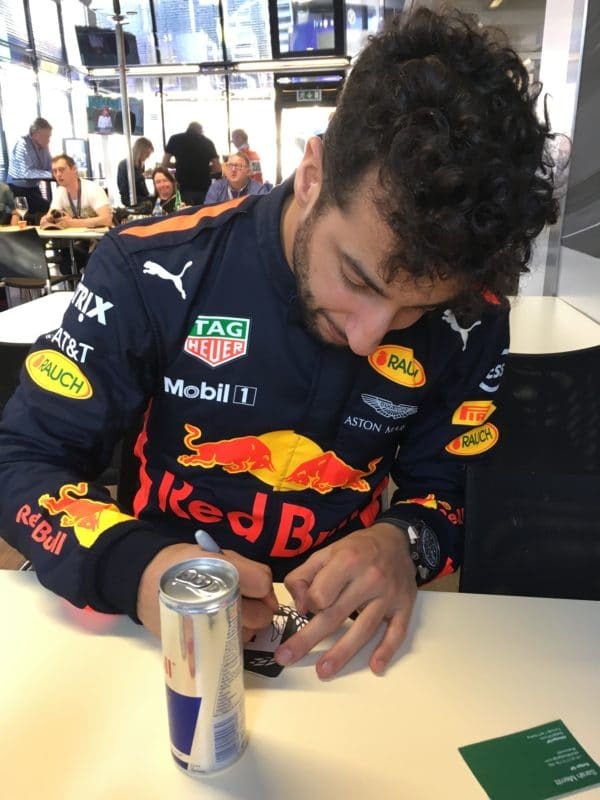 Have a read of his thoughts on the RB13, “shoeys”, and always being genuine on social media ahead of the start of the season at his home race in Melbourne. And yes, he thought our name was cool too…I wonder why! Sarah Merritt: It’s great you could spare some time to sit down with us, Dan. Let’s start off by talking about last year; sum up the 2016 season for us. 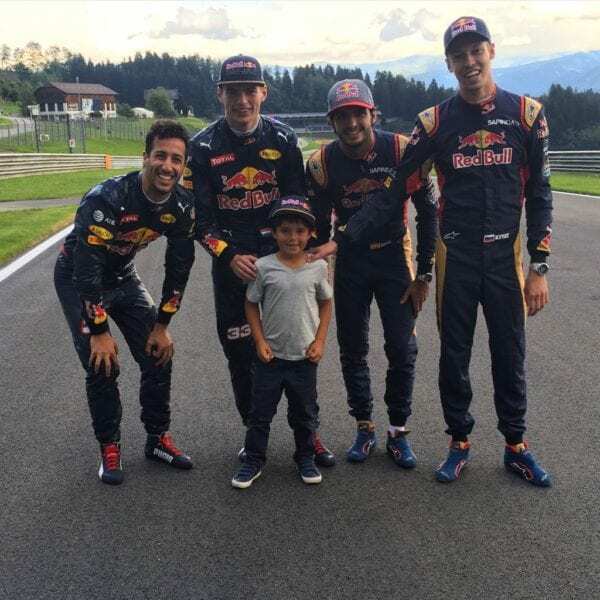 Daniel Ricciardo: Pretty great – it was awesome to get back on the top step! After Monaco, I was like “man…” because it was two races in a row which I’d obviously felt ‘is this ever going to happen?’. I’m not massively religious or anything at all, but I kind of just kept the faith in myself, and I thought if I just keep working at it, it will come, and yes, it finally did. It was a cool year, definitely rewarding. SM: You were so often the smiling person in the podium room, when there might have been a bit of an atmosphere in there, let’s say. Was it a bit awkward at times? DR: Yeah! I don’t do well with awkward silence, and err….there was always awkward silence (laughs) so I’d just talk to myself or talk to the camera! SM: And you did! I loved that moment where you talked to the camera and said “told you I’d do it”. Was that the perfect antidote to any of the feelings you’d have unfortunately felt after the Monaco tyre mix-up? DR: Yes. In a way, nothing will replace Monaco, but at the same time, to win a race last year – I feel I really needed to do it. So it was the cure, basically. It was a bit of a relief. SM: I have to touch on the shoeys. 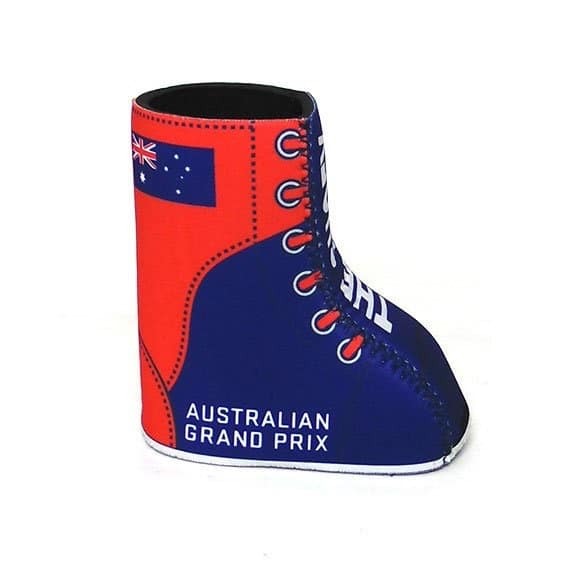 The fan’s loved it, and here at Badger GP, we were often asked to participate in a race round-up show on Eon Sports Radio from Melbourne – big supporters of their man Dan! Will you carry the shoeys on this year? DR: You know what, I’ve been asked a few times and I haven’t really thought much about it, so I’ll say it’s likely, but most likely only if I’m on the top step though. I’ll save it for that top step, but it will probably reappear. 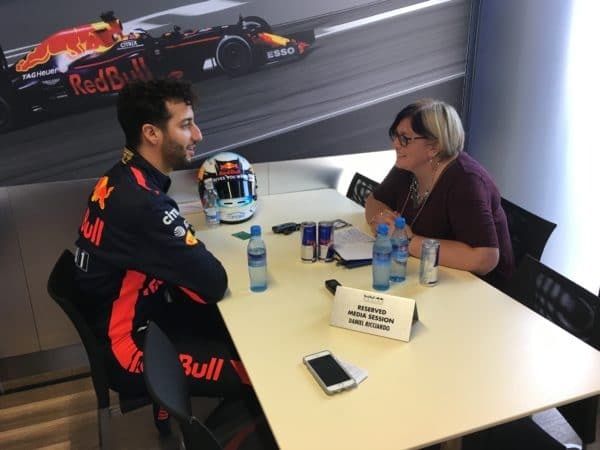 SM: Tell me what it is like being a teammate to Max Verstappen? DR: I think he’s been good to work with. Obviously he’s very competitive, but I think that’s good for both of us. Technically he’s pretty smart, I think. You can tell he has been around racing a long time. Yes, he’s young, but he’s experienced in the sport. He knows cars, he knows how it goes, and he’s not intimidated by the environment or anything. He‘s a racer, so I feel we’ve got a lot of the same qualities in terms of our drive being quite similar. We are both hungry, and we are both not shy to have some fun out on the race track, so that’s cool. SM: And do you share information between you? DR: We obviously do our own thing and try to make our own car as quick as we can. We’ll talk about things, like with the testing. A few things they tried this morning, I asked him how it felt, if it was better, and what direction do you think we’re going to go in. So stuff like that we chat about, yes. SM: But at least you put yourself out there! Anything special you can share with us at Badger? DR: On my social media? Good question! I think I’ll get a bit more content going, like I did a bit of training content and pre-season stuff. I think for the fans it’s cool, so I’ll probably get a bit more of that stuff going along at points of the year if I do something interesting. Otherwise, I’ll keep being an idiot, I guess, probably keep singing in the car. I don’t know, we’ll see! SM: That’s not being an idiot, that’s called having a personality! DR: Yeah, I know! I’ll keep it genuine, that’s important. I don’t want every Instagram photo to be a staged photo. I might throw the odd one in there, but I still want it to be my personality. 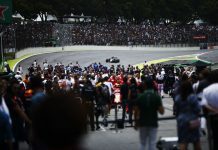 SM: I wonder if maybe it’s time for a rematch with Felipe’s son – maybe perhaps on home turf, whilst you are out in Australia? DR: (Laughs) I know, I need to sort something out with him, because a lot of people have asked for a rematch! It went crazy, I didn’t expect that at all. Felipe showed me the numbers on his Facebook and I was like “woah!”. So we’ll see. We’ll revisit something I’m sure. SM: It would be great, especially as Felipe is now back here in the paddock this year. DR: Yes, I know – and that’s kinda cool. SM: So, to the car. This year. The tests here in Barcelona – can you sum it up for me? How do you feel, are you happy? DR: The cars are fun to drive. They’re fast – Turn 3 here has been full throttle, so that’s a lot quicker than it has been in the past. Turn 9 is nearly full, so they are more fun to drive. Competitively I’m not sure where we are yet, we’re not quite with Ferrari and Mercedes, but we could get to Melbourne and it could be a different story. 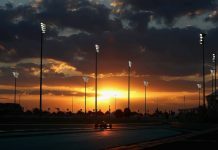 I hope that if the racing is still good, if we can still overtake and all of that, then I think as a spectacle it will be a better season for F1. SM: And you like the new 2017 cars? DR: They look cool – I really like the look of them – they’re lower and wider. I got up to another car yesterday, and I thought “woah, it is A LOT wider”, but it looks cool. 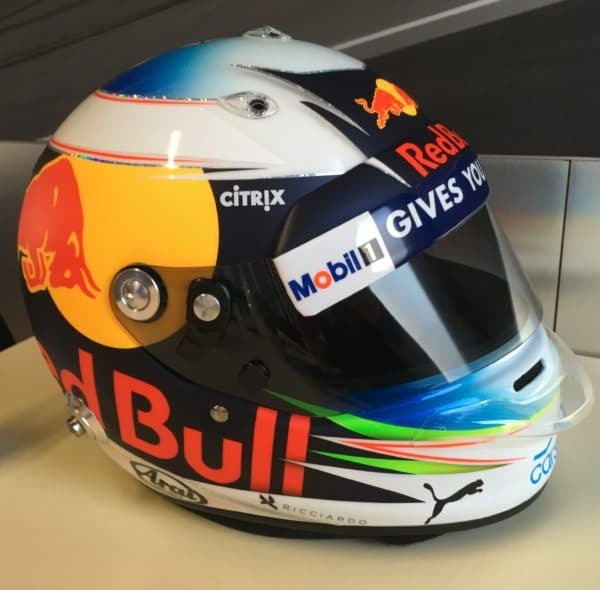 SM: Although you’ve said that you don’t think you are quite up there, ahead of pre-season testing a lot of people were saying that this was the year that Red Bull were going to challenge Mercedes. Do you think that’s still a possibility? DR: I think it’s still a possibility, absolutely. Whether we find that pace in Melbourne is an unknown, but if it’s not in Melbourne, we will discover it. Last year we got stronger and stronger, and I think we have still got that same platform to work from. The car has shown signs of strength, but I don’t think we have really put it together yet, so there’s a lot to learn with this car. 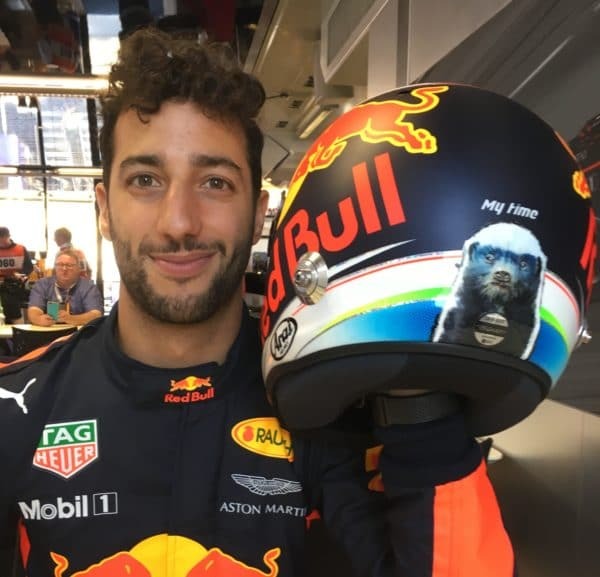 Daniel has brought his helmet along and it has been sitting on the table next to us, so I take the opportunity to have a look at it, and he obliges by showing us the Honey Badger that is on the back of his design. He’s been eating a banana, and there’s also some jelly beans on the table, which I ask him about. DR: I haven’t touched them yet. This banana is actually really good, it might give me my sweet fix that I need! And with that, he is off to his next engagement, with Crofty for the evening’s SKy F1 show. It was fun to catch up with Dan, and his smile and positivity is infectious. I believe I sat grinning at him like a schoolgirl throughout the entirety of our chat! 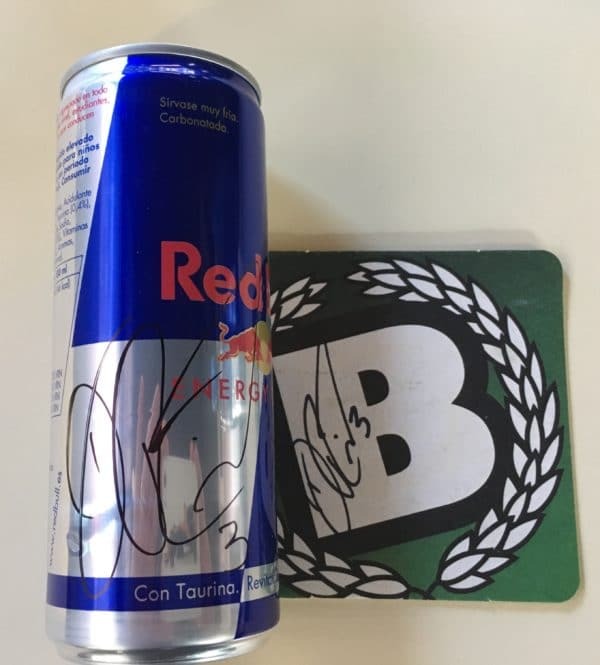 He was also kind enough to sign a can of Red Bull and a Badger GP Coaster as a prize for us to give away. You can also enter via Facebook by sharing this post about the interview with your friends, include the hashtag above for bonus points. We’ll announce the winner after the race.